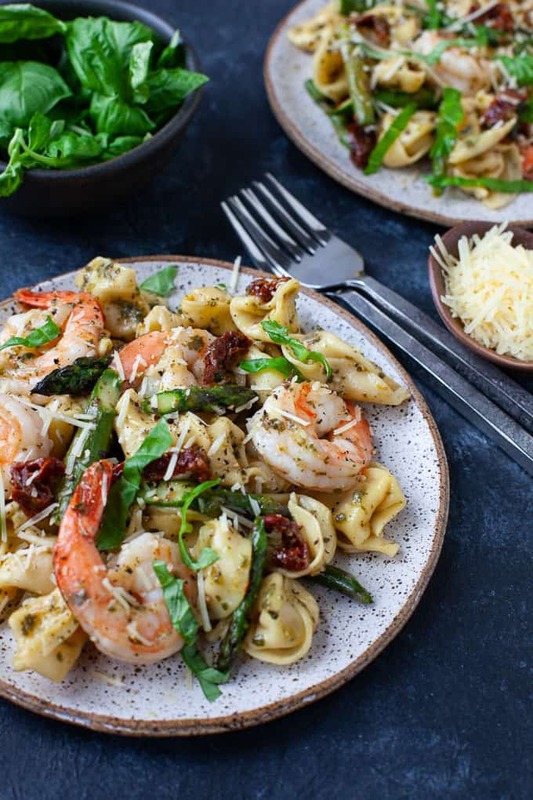 The perfect weeknight dinner, this Three Cheese Tortellini with Pesto Shrimp and Asparagus comes together in less than 30 minutes. 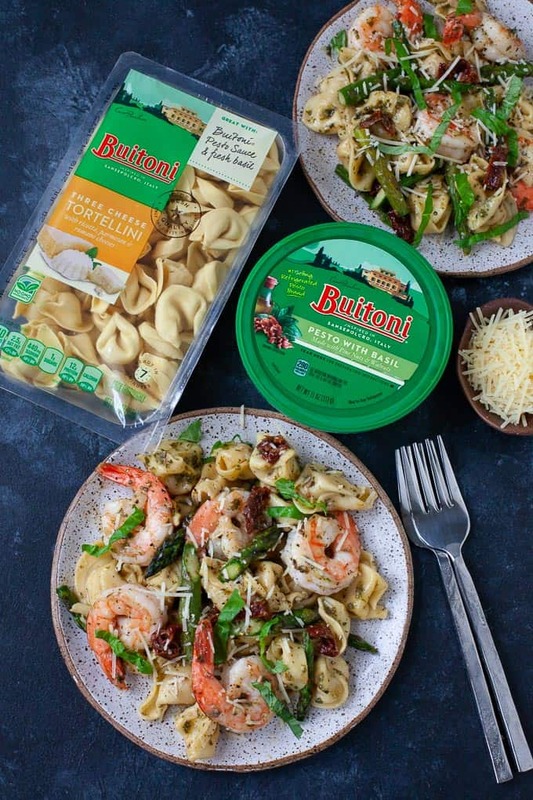 This post is sponsored by Nestlé’s Balance Your Plate program and Buitoni. Thanks for supporting the brands that make TFD possible and as always, opinions are my own! Pasta has unfortunately gotten a bad rep over the years. Blame it on the Atkins Diet of the 90’s or the Keto or Whole 30 diets of 2018, or blame it on the current obsession with demonizing gluten. Any way you shake it, people are afraid to eat pasta. And I get it. It’s so easy to get carried away by sensationalized media headlines telling you that this one food is the reason behind your weight gain or your health woes. And it’s so easy to fall prey to the promises that diets like Whole 30 and Keto dangle before our eyes. 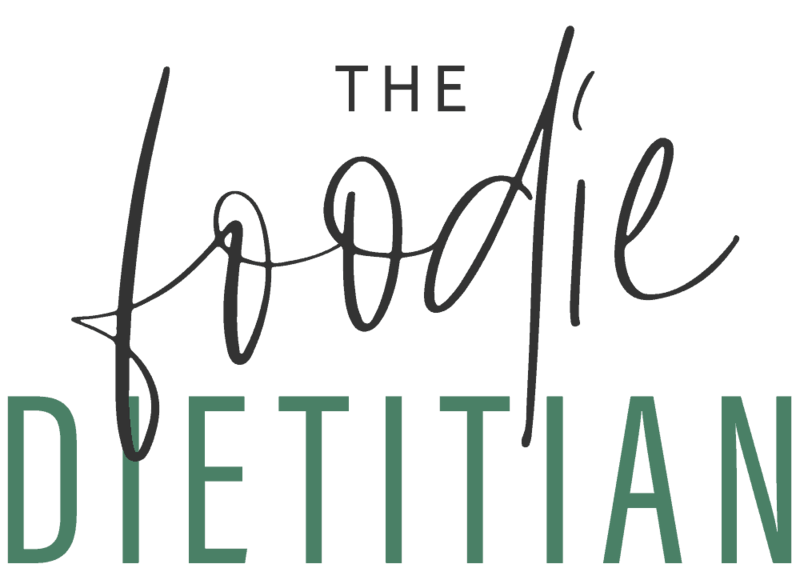 But the reality is, it’s most likely the restriction, deprivation, and emotional stress that comes along with dieting that’s making you gain weight, not the occasional bowl of fettucine. And there’s nothing inherently “bad” or “wrong” about pasta. It’s a carbohydrate, which gets broken down into glucose, which we know is our body and brain’s primary source of fuel. So I like to imagine that when we eat carbs, like pasta, our brain starts to do a little happy dance in celebration of the energy and fuel it’s receiving. And I think our brain does that little happy dance whether it’s white or whole-wheat pasta, because guess what? Both break down into glucose. 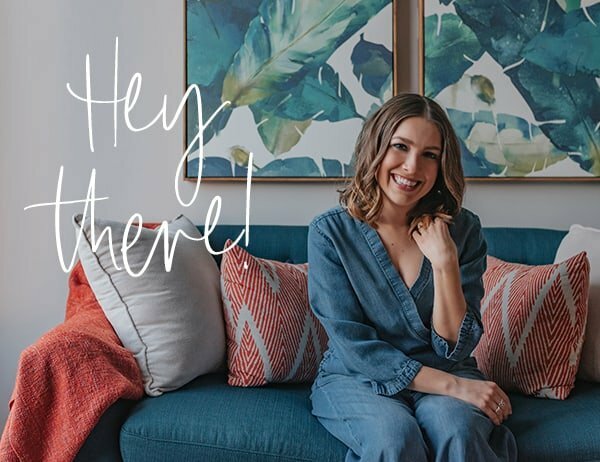 When I talk about intuitive eating with my clients and we’re busting some of the myths around different foods like pasta, I’m often met with the response, “So, are we not supposed to care about nutrition at all?” Because we’ve been so wired to believe that nutrition equals ‘eat this, not that’, we lose touch with the more gentle, holistic nutrition principles that I often talk about with my clients, like balance and variety. Balance meaning aiming for a balance of different food groups and macronutrients (carbs, protein, fat) on your plate and variety meaning a variety of all types of food and nutrients throughout your day, your week, and your month.I look at the benefits of practicing balance and variety with eating in two ways: 1. It helps to ensure you’re getting all the nutrients, vitamins, and minerals that you need and 2. It helps you feel satisfied and satiated. And I think that certain foods like pasta are the perfect vehicles for creating variety and balance in your meal pattern. You start with a blank canvas and make it more satisfying and satiating by adding a variety of colors, textures, and nutrients. Other blank canvases could be pizza crust, a tortilla, a grain bowl, you name it. 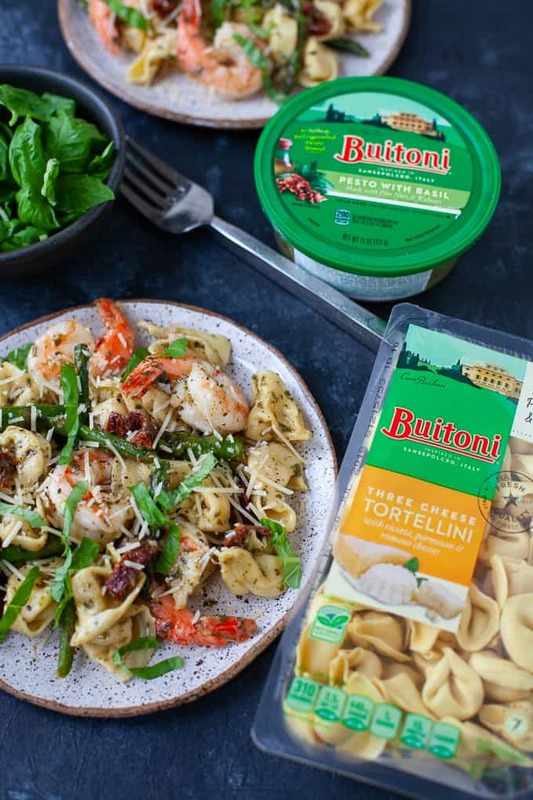 With its simple, high-quality ingredients, Buitoni is a perfect canvas to paint your ideal dinner. 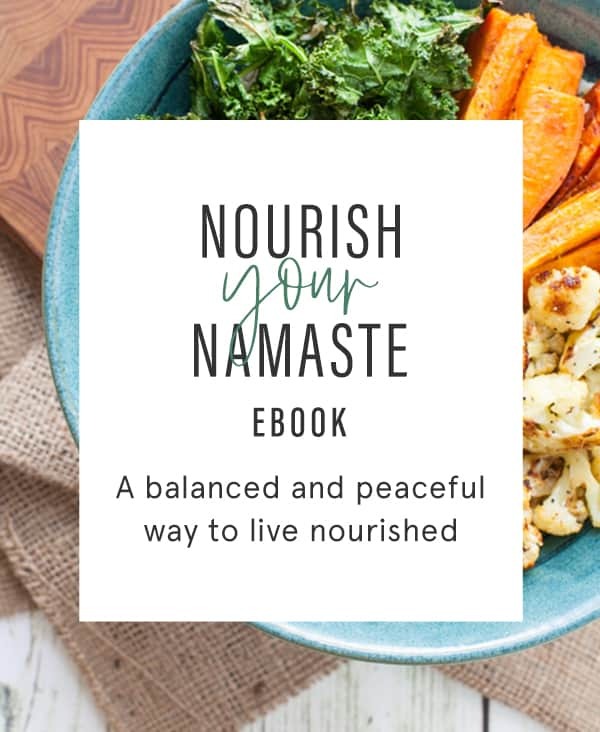 And with the Balance Your Plate concept – you’re able to enjoy a food we all love in a healthful way. Throw in the veggies and lean protein you have available to you – and you’ve got a meal that brings enjoyment and satisfaction, and also provides your body with much-needed fuel. 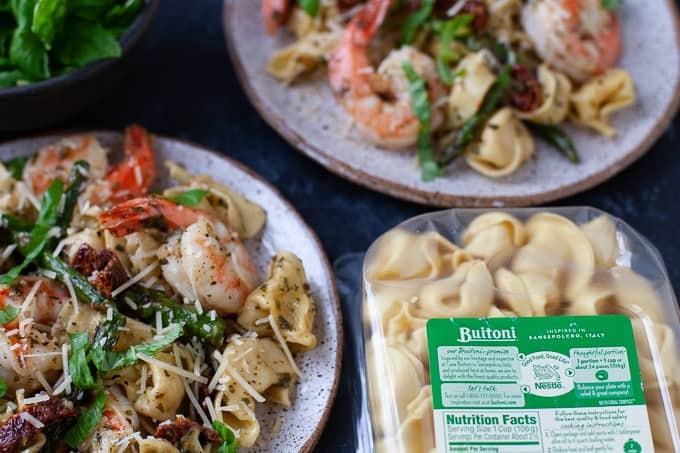 Visit Buitoni or the Balance Your Plate website and Pinterest board for more mealtime inspiration and ideas! Pre-heat oven to 425 degrees F. Line baking sheet with parchment paper. Cook tortellini according to package instructions. Reserve ¼ cup of pasta water. Drain pasta and set aside. 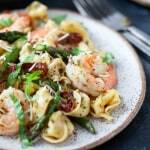 While tortellini is cooking, toss asparagus with 1 teaspoon olive oil and season with salt and pepper to taste. Place asparagus on parchment lined baking sheet and roast for 10 minutes, or until asparagus is tender. In a large sauté pan, heat remaining olive oil (1 tablespoon) over medium heat. Add garlic and cook for 60 seconds, or until fragrant. Add shrimp and cook until bright pink and opaque, about 3-5 minutes on each side. 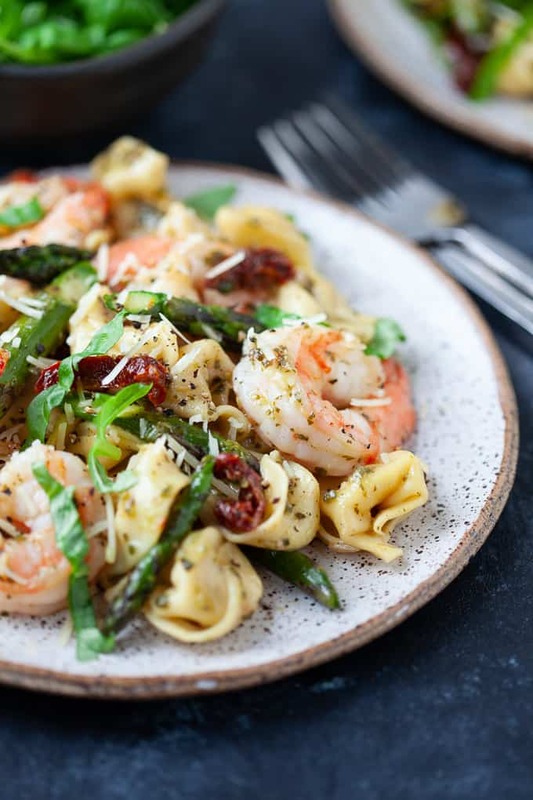 Add asparagus, sun dried tomatoes, tortellini, pesto, and 3-4 tablespoons reserved pasta water and toss to combine until evenly coated. Serve hot and option to garnish with shredded parmesan cheese and freshly cracked black pepper. Tell me, how do you balance your plate (or bowl!) at home? Delicious. I made it for guests and they enjoyed it very much. I added grape tomatoes cut in half. Very easy. Wonderful, Pat! Grape tomatoes sound like a delicious addition! 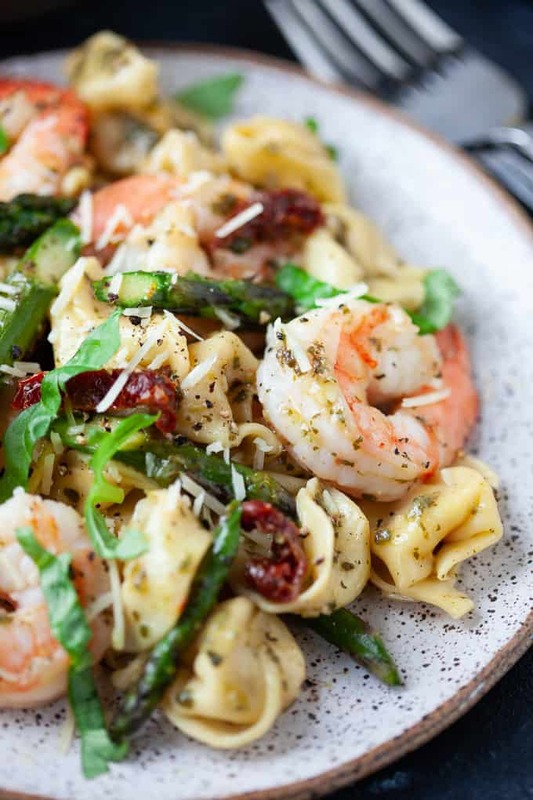 “Pesto shrimp” sounds like something I need to try immediately. The combination of flavours looks delicious. Would love to try it for a weeknight dinner. I love this combination of flavors. It works exceptionally well and it’s always great when a meal is fast and easy to prepare. Thanks, Vince! I’m a big fan of pesto too. Especially this time of year! Thanks, Megan and Carlie! Totally – something the whole family can enjoy! This looks delicious and I love how easy it is to whip up! What a fun weeknight dinner! YUM! Thanks, Chelsey! It really is SO easy.